2005; 560 pages. Genre : Action Thriller. Overall Rating : B-. Notes : Second book in the "Diogenes Trilogy". The first book was Brimstone, reviewed here. Special Agent Aloysius Pendergast receives a message from his younger brother, Diogenes; who informs him of his plan to commit the Perfect Crime. He even tells him the date - 28 January. Alas, even with the "Who" and "When" filled in, the "What" remains a mystery, until one by one, Aloysius' friends and associates start to turn up murdered. This is "Sherlock Holmes vs. Professor Moriarty" moved up to the present day. Aloysius is Holmes, naturally; and NYPD Detective Vincent D'Agosta plays his Dr. Watson. Diogenes combines the mental acumen of Holmes' brother Mycroft with the pure evil of Moriarty. A most worthy opponent, with an undying hatred of his brother. The book takes a while to get going, with only a grisly killing or three to liven things up in the whole first half. But when it finally kicks into gear, it's a great read, with lots of twists, humor, red herrings and action to keep you turning the pages. The characters are great. Aloysius isn't perfect. Indeed, for most of the book, Diogenes runs circles around him. And mention should be made of the reporter Smithback, who'll do anything for a scoop, but nicely is not cast into that Hollywoodian stereotype of being an arrogant stooge. In the end, however, the book is drawn down by the fact that it's #2 in a 3-part series. So you know that, while Good must prevail, Diogenes is going to live to fight another day. And while the Aloysius-vs-Diogenes storyline would get an approving nod from Conan Doyle, there's a Preston-Child omission here - the "Is It Natural Or Is It Supernatural" issue that came up in each of the other three books I've read by these guys. Sometimes it's the former; sometimes it's the latter. The fact that it could be either one is one of the real hooks in a Preston-Child story. In Dance Of Death, we get teased by the possibility of one of these, but like a morning Phoenician thundercloud, it gradually dissipates into nothing. So we'll give this a B-, with the understanding that a mediocre effort by these two authors is still above-average when it comes to a killer-thriller novel. 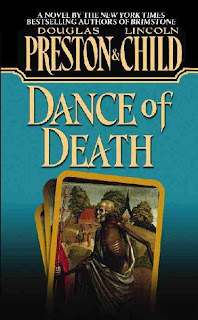 And advise potential readers of Dance Of Death to read Brimstone first. I love a worthy villian. you'll like Diogenes then. his "perfect crime" goes off without a hitch. Aloysius really is still clueless when the dastradly deed goes down. it gets foiled by something done by the Museum, which was unforeseeable by Diogenes. Count Fosco in The Woman in White is my all time favorite villian in a book that I've read. Lula - by Wilkie Collins? Or is it a different Woman in White? I'm reading the Collins' WIW very, very soon. Yes, one of my favorite books. He is a most excellent villian.